This traditional fishing village of Alvor is set right at the mouth of the River Alvor estuary on the western Algarve, Portugal. 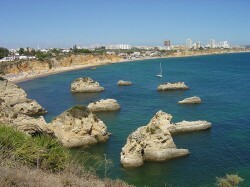 The area offers some wonderful sandy beaches on which to enjoy the Portuguese summer sun and indulge in a variety of watersports, from the wide sandy expanses of Alvor Beach itself and the 5km Meia Praia, basking in rhythmic beat of the Atlantic surf, to the rock-flanked and much-photographed Praia dos Tres Irmãos, Praia da Rocha and Dona Ana. 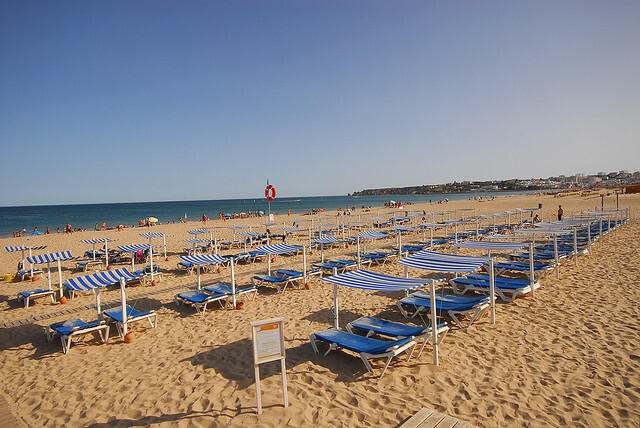 Alvor Beach occupies the western section of Alvor’s long sandy beach and is more of a sandy outcrop, separating the salt waters of the Atlantic Ocean from the lagoon of the River. This is a place for fun and frolics on the sand and appeals to visitors of all ages, with plenty of free space to play beach sports, even in high season and watersports for hire include, sailing, windsurfing, pedalos and motorised sports. If you prefer simply to relax and watch the world go by, Alvor Beach offers plenty of sunbeds and shades to rent and when the hunger pangs hit, head to one of the two restaurants which serve snacks, drinks and more substantial meals throughout the day. 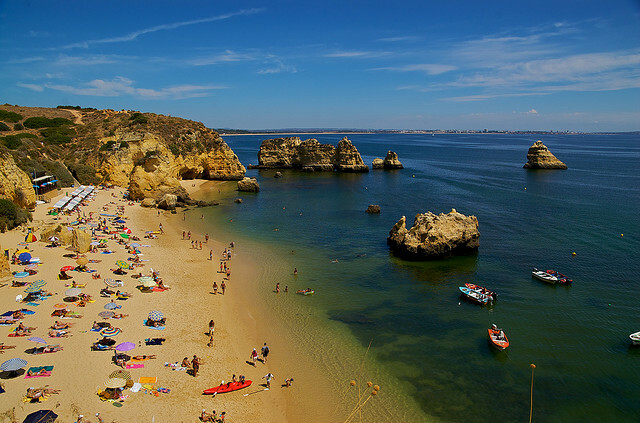 If you are staying in the village, Alvor Beach is very accessible on foot from many of the local hotels and apartments, and many of the others located a little further away provide free shuttle buses to make reaching the beach as trouble free as possible. There is plenty of car parking in shaded areas and thanks to its flat layout, the beach is highly accessible to all. Praia dos Três Irmãos occupies the eastern end of the sandy expanse that flanks Alvor village. Praia dos Três Irmãos literally means “Beach of the Three Brothers” and is so named because of the three tall rock formations that rise from the ground and tower over the sands beneath. Some of the area’s best hotels are located on and above the beach here and offer beautiful, unbroken views out across the Altantic from dawn until dusk if this is where you choose to stay. In fact, guests staying in the five-star Pestana Alvor Praia Hotel overlooking the beach have the benefit of an elevator that transports them straight up the inside of the rock face to the comfort of their resort. Praia dos Três Irmãos offers plenty of shelter thanks to the interesting rock formations and cliff that hugs the edge of the cove and is extremely picturesque, perfect for lying on a sunbed and simply admiring the beauty of your surroundings. There is a restaurant at the edge of the beach, marking the spot at which it separates from Praia de Alvor, which serves food and drink throughout the day and into the evening. 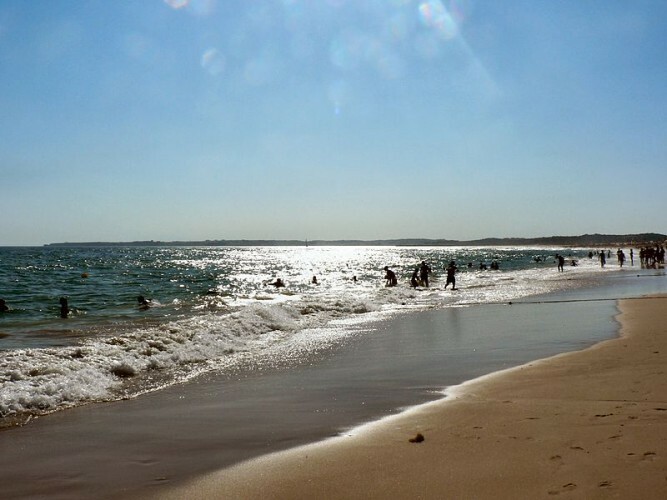 As with Praia de Alvor, the beach is easily accessible on foot or by bus, and has plenty of parking offering easy access straight onto the beach. 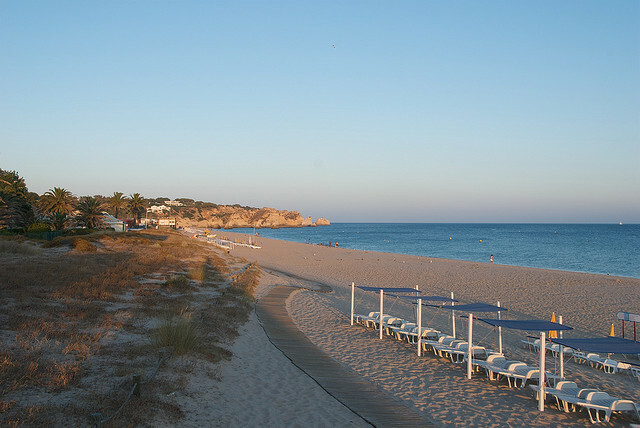 There are some delightfully picturesque beaches either side of Alvor village. 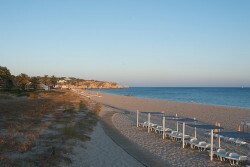 Praia da Rocha is situated close to nearby Portimão, several kilometres away and is well worth the visit. The beach consists of a wide sweep of golden sand with a wooden walkway running along its length, flanked by a series of cafés and restaurants catering to the many visitors who find there way here each day. Towards one end the Fortaleza da Santa Caterina presides over the shoreline. Dating back to 1691, the fort offers views over the entire length of the beach, down to the marina, and is a popular spot for watching the sunset as it dips down over the horizon, leaving behind it a glistening array of reds, yellows and pinks before plunging once more into darkness. Praia da Rocha is very accessible thanks to its long wooden walkway and offers several access points and car parks at regular intervals. Many watersports options are available including motorized options such as jet skis, along with paragliding, pedalos and windsurfing. Praia Dona Ana is one of the most photographed beaches on the Algarve. Located back towards Lagos, it is flanked by majestic rock formations and a steeply rising cliff that drops down to hidden grottos and inlets of flat, golden sand, perfect for fun, photographing or simply working on your tan. A series of restaurants and bars has been “embedded” into the cliff walls to maximize the available space on the beach, creating an unusual and not unattractive aesthetic and providing the perfect spot from which to enjoy the scenery over a taste plate of grilled sardines. Take time to explore the lighthouse that presides over the beach. 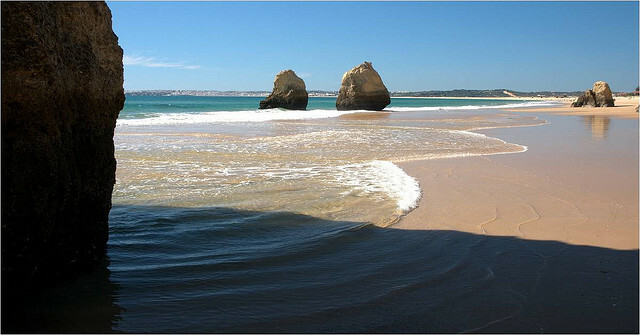 Meia Praia stretches all the way from Lagos Marina to the river mouth, providing 5km of unbroken golden sands. It offers plenty of watersports and is popular with surfers during peak hours when the Atlantic waves are at their biggest. 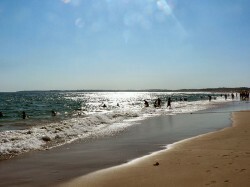 There are so many other beaches within easy reach of Alvor, Portugal. If you are here for more than a day or two, take the time to jump on a bus or in your hire car and discover them for yourself. You will not regret it.